When you buy a Ford Escape from Hempstead Ford, you’ll get one of the top compact SUVs that comes with an assortment of amenities. These added extras will help make your drive easier while providing a more enjoyable ride. 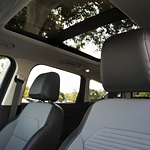 The Vista Roof is a panoramic sunroof that will allow you to let more of the fresh outdoor into the cabin on warm days. The large forward panel of this amenity can open fully or tilt upward to let in a little bit of air. The fixed rear skylight will help you soak up more natural sunlight. To make turning and steering straight less strenuous on your hands, an ergonomically designed steering wheel can fit the shape of each hand better. The comfortable materials that are used to make the steering wheel can be even more soothing for your hands. On days when temperatures are low, the heat feature can be turned on so that you won’t have to touch a cold steering wheel.